Health Food Drinks market in India is currently going through a curious phase of change in market dynamics. On one hand the category is witnessing a scenario of reducing growth – overall industry has grown at ~6% in the period of 201618 and is expected to stay at similar levels in the coming year; and on the other hand, several major firms have entered the market or are planning to launch their products in near term. Health Food Drinks (HFD) in India are primarily malt-based milk drinks that act as taste enhancer along with nutrition fortification of milk. Earlier known as Malted Food Drinks (MFD), the category was introduced in India in 1950's through launch of Horlicks and started strengthening its position in 1960's with successful launch of operation flood. HFD in India was a USD 860 Million market in 2017; while the category grew at a good pace of ~10% y-o-y till 2015-16, since then the volumes have remained stagnant. Market size is expected to be greater than USD 1 Billion by 2020 growing at 5.6% CAGR. The market is currently dominated by GSK that has > 60% market share with key brands – Horlicks and Boost in its kitty. Other key players include Mondelez International – Bournvita, H.J Heinz – Complan and Abbott Nutrition – Pediasure. Recently, Nestle has relaunched its brand Milo in ready to drink format while Danone has introduced Protinex. As we speak, more players are eyeing the category and several brands such as Enfagrow, Viva, Amul Pro, Powervita are crowding the segment. The current market for HFD can be clearly segmented by popular flavours – chocolate, plain malted and vanilla. Chocolate, by far dominates the market being a hot favourite among children of all age groups. General trade is the single largest channel for sale of HFD currently in the country constituting for close to 60% of the market. Modern trade at ~19% and Pharmacy at ~18% are at a far second position. However modern trade is set to become a major platform as its growing at a higher rate compared to other formats. Since its launch, Horlicks has successfully maintained leadership position in the market. They pioneered and grew the category by educating customers as well as innovating product in past 65 years. They have also systematically grown reach in the country and penetrated even to rural India through their vast network of distributors and localized initiatives. However, competitors began upping their game in late 2000's as the market for HFD matured. Pediasure that had entered India as a medicated nutrition supplement for children with severe health ailments prescribed by doctors and was available only in pharmacies – made strategic decision to realign its product and positioning in 2008. At the same time Horlicks and Complan were undergoing a fierce battle of their ad communication in court and of prices on the streets. Over the next few years – Horlicks expanded its reach by appointing more than 7000 rural distributors, Complan focussed on aggressive marketing strategies to strengthen its position but lost its second position by 2016 to Bournvita that grew steadily on back of its' strong chocolate flavour and Pediasure kept expanding it's base majorly in metro markets backed by strong 'healthy' perception and unique market positioning. By 2016, Horlicks had lost its market share by 800 basis points to 51% and strategically the Urban Toddler market to Pediasure. Pediasure that had priced its product at twice that of the larger players – has been growing at four times the overall market and has gained a market share of 9% in less than a decade of its relaunch. Most players have upped the ante in the category with the introduction of new flavours and variants backed by aggressive marketing and distribution. Bournvita has emerged as the second largest player at 15% followed by complan which is struggling to retain its market share at 13%. Multiple other players have also entered the market – Nestle has relaunched Milo, Danone has introducedProtinex Grow – a rival to Pediasure in the premium priced category. Going forward, the competition in the segment is expected to intensify not just due to launch of large number of similar products but also due to rise in substitute products such as RTD flavoured milk, chocolate syrups among others. HFD in India established its base on the back of lack of quality milk in most parts of the country. North and West India that have been traditionally dairy-rich markets have seen slower adoption of HFD; while East and South India that consume HFD in water in absence of quality milk to fulfil nutritional gaps are the largest market for HFD and the first battleground for any new entrant. Currently, South & Eastern India account for more than 60% HFD consumption. 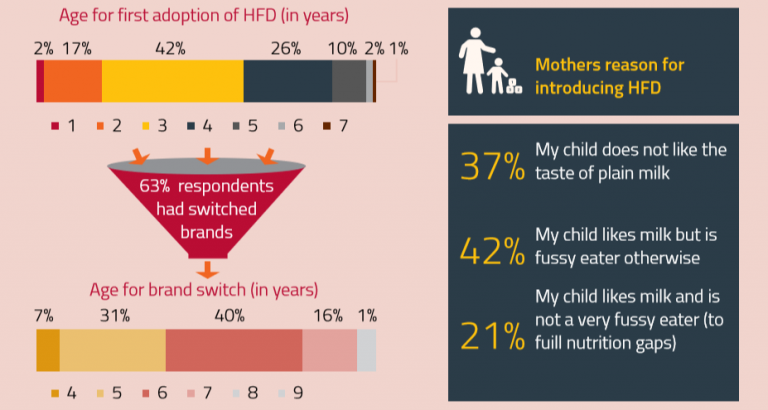 HFD consumption in India has gradually risen as consumers are paying more attention to product labels and nutrition charts. Earlier, the primary motive of adding HFD was to enhance the taste of milk to ensure that the child consumes it; however, in recent years adding HFD is also seen as meeting the overall nutritional gap in child's diet. This brings added convenience to managing growth of child and puts parent's mind at ease. 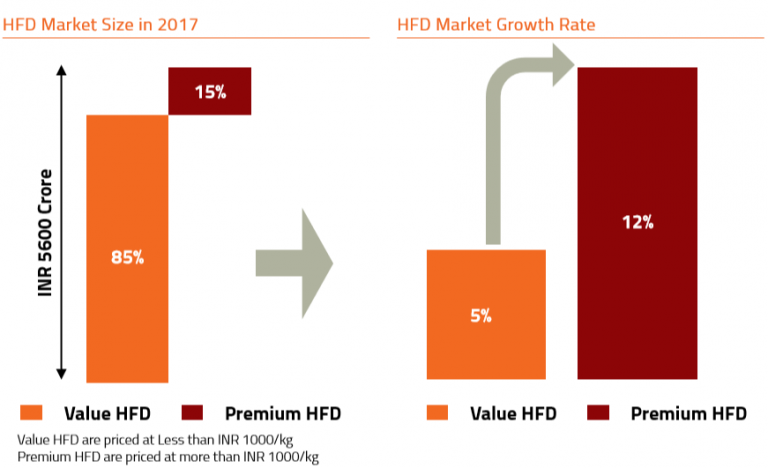 Accordingly, willingness to pay for HFD has also grown recently and has created a market for premium brands that have gathered consumer trust in meeting nutritional requirements. This market for premium nutritional position is expected to expand in the coming years. As the health awareness for consumers is expected to grow further and nutrition trumps taste in product purchase – players would need to focus on offering products that retain the same product quality – in terms of mouthfeel, flavour profile and sweetness but with less sugar content. India is one of the large markets of HFD retail sales and is on the path to become the largest by 2020, when it will account for ~45% of all global malt-based hot drinks retail volume sales. With rising affordability and busy lifestyle, consumer segments will emerge that may be more inclined to move towards premium-priced, but nutrition focussed products that meet their specific age-wise, nutrient-wise requirements. To expand the market, companies will need to focus on innovation by investing in scientific research in product, improving accessibility both in terms of geography and SKU and sharp consumer insights.